I have cooked pasta like a risotto frequently by now, though every time is the same intense discovery and pleasure. Why did we not think about doing this long ago, I ask? Or maybe we did, in a place I did not live in or know about! My first time trying a dish like this was actually in a small restaurant which name I forget. Quite useless really, yet I kept the essential: the sensation and texture of the pasta in my mouth. A je-ne-sais-quoi that made pasta Al Dente just the way I like, with every single pâte flavored by the broth it cooked in, soaking it up. 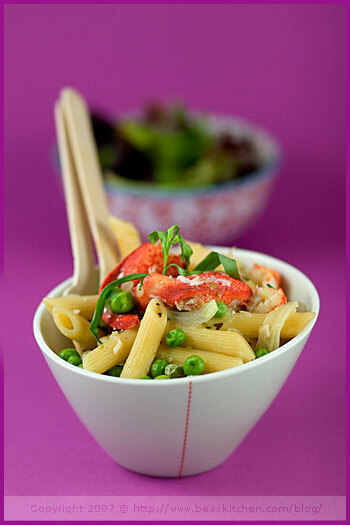 Since Penne remains one of my favorite pasta, over Farfalle or Rigatoni for example, I chose to cook it in this recipe. Not sure why and when it started, probably one of these things that I do not need to memorize and remember — who cares — but I prefer big pieces of pasta to small ones. A bulb of fennel was lost in my fridge and a jar of fresh lobster meat had to be used in the coming days. Odd things can happen in my fridge. I had frozen peas, always nice and handy for emergencies and a bunch of fresh tarragon, which I seem to use and use again and again. I was quick to compile this recipe, giving us a dinner that I first thought might be boring, yet turned into a delicious one. If I could hug kiss — we Frenchies do not hug that much — whoever invented pasta and risotto, I would do it right as I write. These people are real geniuses. In a pot, heat the chicken stock and keep warm. Slice the white fennel bulb thinly (use a mandoline if you have one). Heat the olive oil in a thick-bottomed pot. Cook the chopped shallot and garlic for 2 to 3 mns, without browning. Add the fennel and continue to cook for a few mns until tender. Add the penne and coat them for 1 to 2 mns. Then add the first ladleful of warm broth. Cook on low to medium heat, keeping an eye on it. Once the broth is absorbed, add another ladleful of broth and keep going until the before last ladleful. Before the last ladleful, add the peas. Once most of the broth is absorbed, stop the heat and add the chopped lobster meat, the lime zest (grated finely), chopped tarragon and cover. Let rest for 2 mns before serving warm. With it, I served a large green salad with a hazelnut- white balsamic vinaigrette. Note: For a vegetarian version, omit the lobster. Dans une casserole, chauffez le bouillon de poule. Gardez-le au chaud. Coupez la partie blanche du fenouil en tranches très fines (utilisez une mandoline si vous en avez une). Chauffez l’huile d’olive dans une cocotte. Faites revenir l’échalote et l’ail hachés finement pendant 2 à 3 mns, sans colorer. Ajoutez ensuite le fenouil et poursuivez la cuisson pendant quelques minutes, jusqu’à ce que le fenouil soit plus tendre. Ajoutez alors les penne et enrobez-les pendant 1 à 2 mns. Versez une premiere louche de bouillon chaud et faites cuire sur feu moyen à doux. Surveillez. Une fois que tout le bouillon est absorbé, ajoutez une deuxième louche et continuez ainsi. Avant la denière louche, ajoutez les petits pois. Une fois que tout le bouillon est presque absorbé, arrêtez le feu et ajoutez la chair de homard coupée en dés, le zeste de citron très finement râpé, le jus de citron vert, l’estragon haché. Couvrez pendant 2 mns avant de servir. Accompagné d’une belle salade verte, avec une vinaigrette huile de noisette-vinaigre de balsamique blanc, c’est délicieux. Remarque : Pour une version végétarienne, supprimez le homard. Oh my goodness! This is brilliant … to cook pasta like risotto. And of course the photo is too beautiful. Look at that lobster just waiting for me to eat it! brilliant! cooking pasta like risotto. i’m going to try this very soon. 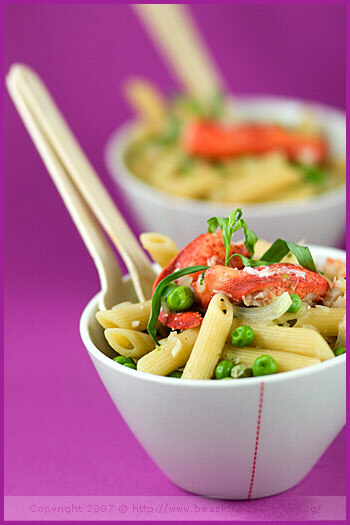 Fennel and lobster…so good together! As always, beautiful photos, Bea. Wow, how really beautiful. Wish I had just that little bite. You know, the Italians do have a pasta dish cooked like risotto, They use a thinner pasta, like spaghetti, and break it up into little pieces. Then they cook it just like you do above. It’s very delicious. déjà j’adore cette manière de cuire les pâtes, mais si tu pousses la tentation jusqu’ à y associer homard, fenouil et pois, je suis à deux doigts de sauter dans un avion, crois moi! Ah justement tu cuisine du fenouil ici! miam! c’est superbe! Moi aussi j’ai adopté cette cuisson des pâtes depuis la première fois que je les ai testées. La prochaine fois j’essaierai ta recette! or one more kiss to lobster! I like lobster a lot! Great idea risotto pasta. I agree with you, I prefer smaller pasta to the larger ones, contrary to my husband’s preference. But spaghetti, long noodles, remain my all time pasta love. Decidement, cette cuisson est a la mode, il va vraiment falloir que j’essaie. Avec du homard je veux bien toutes les pates du monde moi. Who would have thought to do pasta like that? Excellent idea and I’m drooling over your dish, put lobster in anything and I will love it. It certainly sounds interesting, and as always your photographs are beautiful. 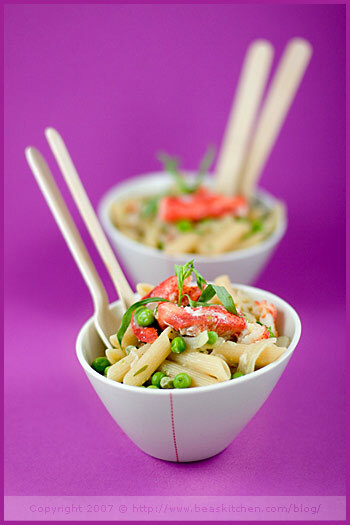 At first I thought you had chopsticks in your dish, but realized they are a fork and spoon. Lovely colors! Beautiful photo, I can almost smell the pasts. teste et persuadee !! j’adore cette nouvelle facon de preparer les pates. Merci ! I love cooking pasta this way. In Mexico they do this and it is called “dry soup”. But, they use thin noodles. I like the idea of the penne. Lovely!